Dan and I have been spending our evenings more often than not lately listening to jazz and sipping cocktails, sitting in the part of our apartment we lovingly call the library because of its enormous bookshelf on one wall, with our feet up and our and our eyes fixed on our respective laptops. Sometimes we even have conversation. It’s not a bad way to spend the post-dinner hour. We tend to reflexively gravitate toward spirit-forward brown liquor-based kind of drinks. Sometimes I forget how good a citrusy gin drink can be. 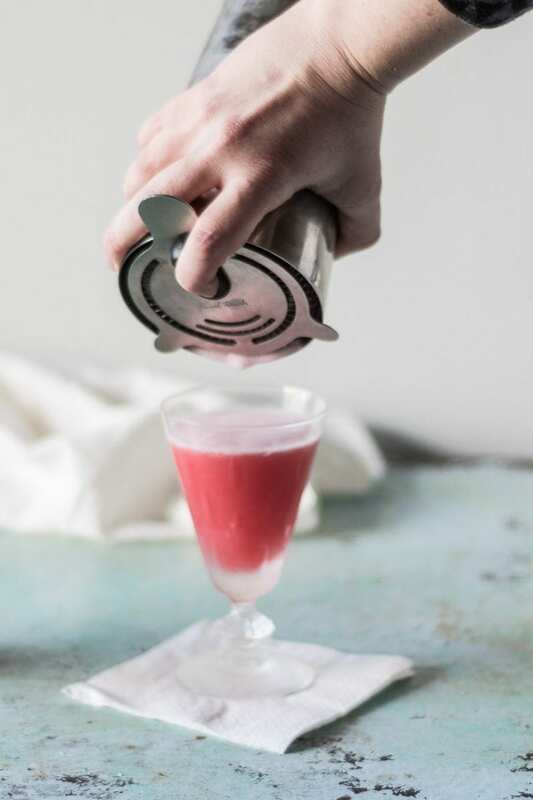 Especially one like this Clover Club, with a simple raspberry syrup and a frothy egg white thrown in to give it some voluptuous oomph. 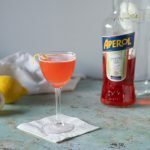 It’s a pre-Prohibition classic that’s named for a Philadelphia men’s club of lawyers and bankers established at the Bellevue-Stratford Hotel in the 1880s. 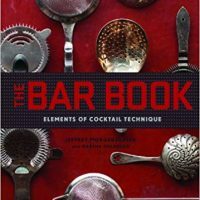 The drink started appearing in cocktail books in the 1910s and by the 1930s had fallen out of favor for being a girly drink. 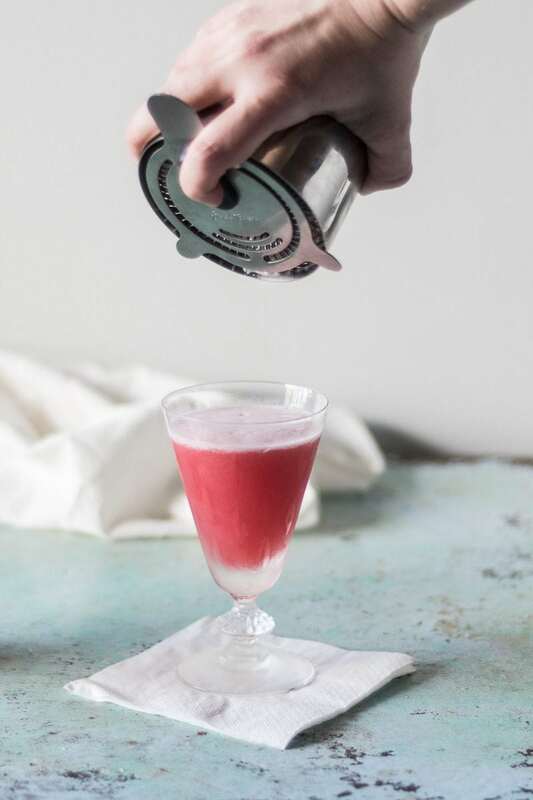 And it’s too bad, because the Clover Club is a worthwhile drink that’s enjoyed something of a revival in the recent cocktail renaissance. Yes, it’s pink. And a lovely shade at that. But it’s also bright, light, and refreshing with a nice balance of sweet and sour. There are many versions of this drink out there. 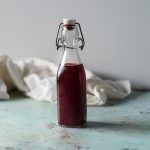 Some that use grenadine in place of the raspberry syrup, which I think is a mistake, because the raspberry syrup is so incredibly easy to make and brings a lovely berry flavor to the mix. Some versions use only a dash of syrup, which is the kind of measurement I hate for any liquid that doesn’t come fitted with a dash-appropriate top like on a bottle of bitters. Also, I don’t think a dash is nearly enough. I like the balance of this one with equal parts raspberry syrup and lemon juice. 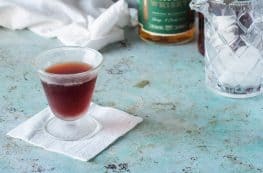 Some people add dry vermouth, which is fine, if you tend to like things on the dry side. 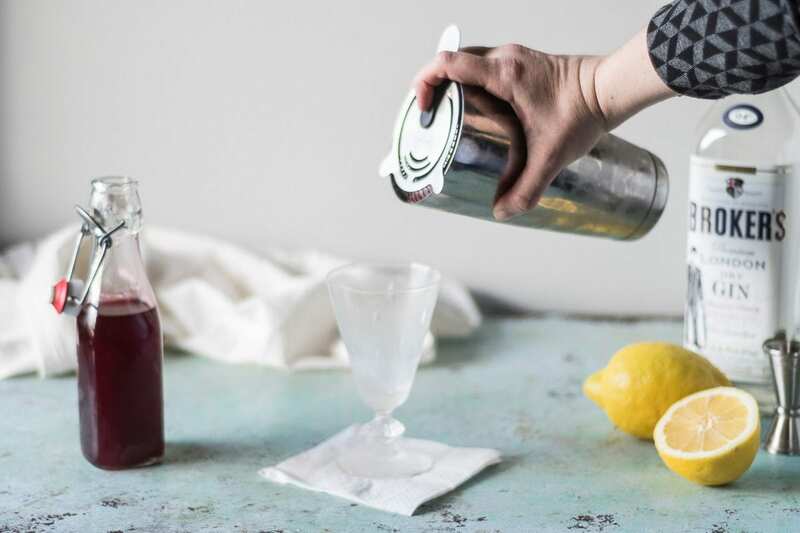 Personally, I love what happens to this drink with a little bit of St. Germain or other elderflower liqueur, which I think acts as the perfect delicate go-between for the lemon and raspberry. It’s not exactly traditional, but it is quite nice. 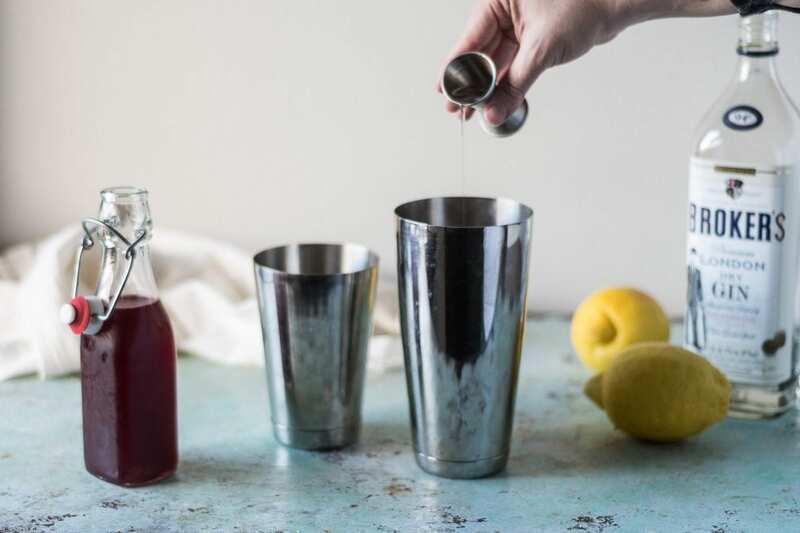 It takes the drink in a sweeter direction, which in this case works really well (and I’m thinking of our friend Ed here, who always asks for the sweetest drink on the menu and wouldn’t be put off by something being pink). 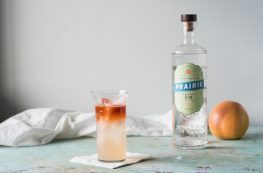 It’s a delightful little concoction, perfect for spring and summer. One you’ll want to keep around, regardless of how you feel about pink. Chill a cocktail glass. Add all of the ingredients to a shaker (but don't add ice) and dry shake for about 30 seconds, or until the mixture is nice and frothy. 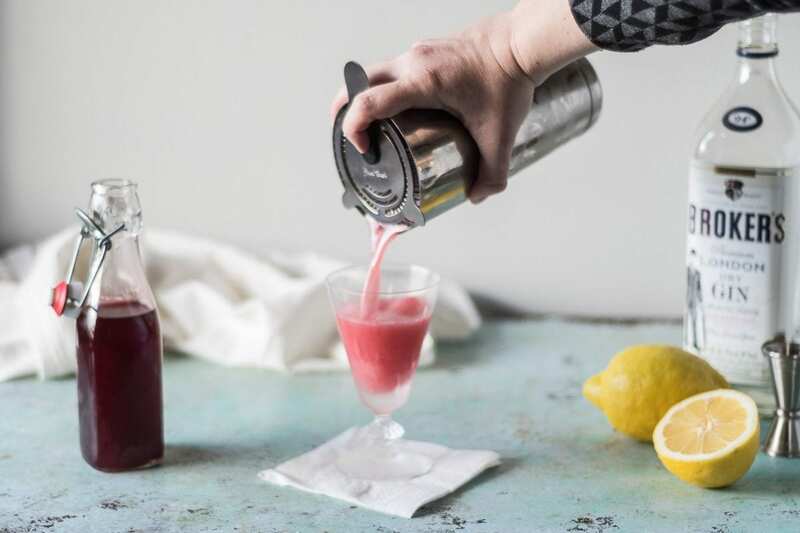 Add ice to the shaker, and shake again for about 30 seconds or until the drink is thoroughly chilled. Strain into a cocktail glass, and serve. Looks delicious can I join for a drink, I tried a recipe with raspberry and bourbon not with gin. I will get a try looks so perfect for date night with my hubby. I’m not a drinker but this is really pretty looking! I totally thought this was going to have clover in it! Lol. The raspberry and elderflower sounds delicious! I haven’t tried adding an egg-white to my drink yet, but it looks so frothy and yummy! I know the egg white thing can be a little scary, but the froth is so delightful. It’s so worth trying! What a delicious looking cocktails. Thanks so much for sharing. Sipping this to jazz sounds like a great night! Oh, you’re sweet! It is!